It's been 3 weeks since I started did the Bliss Kiss Pure Oil hydration treatment and since using Bliss Kiss Pure oil on my nails regularly. I am sincerely impressed and in love with this cuticle oil. It's not just a regular oil. It absorbs into your skin pretty quickly, so you're not waiting forever with oily fingers. 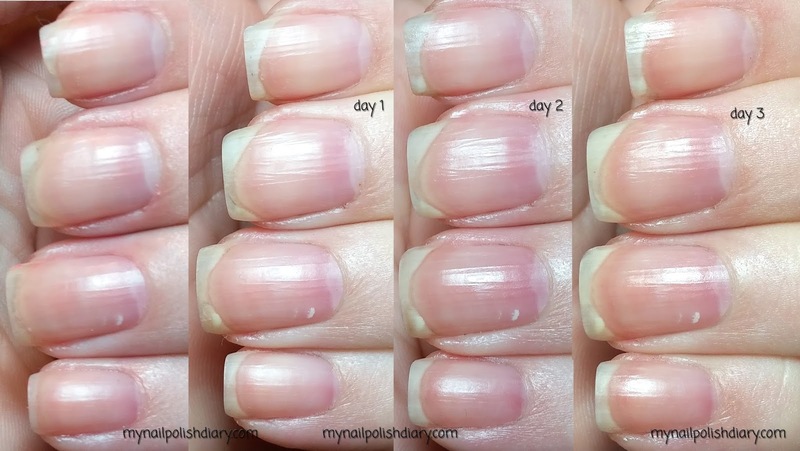 Once it absorbs (in less than a minute) you're left with not just healthy looking but actually healthy cuticles and nails. My cuticles are not dry or cracked looking and my nails are whiter and definitely more flexible. I've had a break since starting but to be honest, there was no way this wasn't going to happen considering the accident that cause it. I have bumped, bent and slammed my nails into everything you would normally during the day. (and more probably, I am a bit of a klutz). I really feel like the flexibility is saving my nails during these moments. Another coupld of things that have stopped happening is I'm not breaking off the corners of my square-ish shaped nails and my thumb nails tended to split at the middle and I'd have to wait for them to grow out and then file off until it grew out, only to have it happen again in a month or so. So far, no cracks! Also, I think the ridges in my nails are lessening. I never ever buff, but use a ridge filler to smooth my nails, but seriously the ridges are not as prominent. I started using Simply Smooth ridge filling base coat 2 weeks ago, and I think it is divine. It applies so nicely and really makes the surface smooth for the polish application. I am totally converting to this product line. I'm definitely going to try out Simply Quick fast drying top coat as soon as I finish my stash of qdtc I have on hand. The results are pretty noticeable. The tips of my nails (free edge) are much whiter. I had a peel on my index finger that actually mended and has not given me any trouble since the treatment. When I do my mani I put the oil around my cuticles and skin around my nails before I remove the polish with pure acetone. Once the polish is removed I wash my hands and then apply the oil to my nails and cuticles and rub in. I let it sit for 5 or 10 minutes while I gather the polish and anything I'm going to use on the next mani. Once I've done that I use alcohol on a cotton ball and rub over the nail to remove any lint, oil or anything that might hinder the polish adhering to the nail. Here is how my nails currently look. I've stopped using my beloved Nail Tek II treatment and ridge filling base coat. I do not need them anymore. In reality, they were probably making my nails more brittle. Another thing I don't need to do is clip excess cuticle growth. I just use cuticle remover and push back a little. No trimming and they look nice. I'm completely happy. I would recommend anyone interested in improving their nail and cuticle health to try out Bliss Kiss. P.S. I was not compensated for this post in any way. I purchased all the products I mentioned myself.